Recently, Ice Bucket Challenge has gone viral around the globe. World leaders like Barack Obama and tech giant CEOs like Satya Nadella an Mark Zuckerberg have already taken the challenege. But here, in India, the plot is different. All the credit goes to Manju Latha Kalanidhi, a journalist based in Hyerabad. She got the iea of Rice Bucket Challenge and had the thought that in India, everyday around 7000 people die out of hunger, while thousands of tonnes of food is wasted. So, we could give some food to people who really need it. It is a kind of idea, that you will also think about: “Why didn’t I think about it?” Well, all people are not the same and some people have got very brilliant ideas. She asked for help from friends to cook or buy one bucketful of rice and feed the poor in the locality. One can also donate medicines worth Rs. 100 to the nearest government hospital. “It’s local, desi and a practical solution to issues in the vicinity. Instead of wasting water on ice bucket challenge, save water and feed the hungry,” Manju Latha wrote on her Facebook page. The challenge is simple: you take a bowl/ bag or even a bucket of rice and donate it to the needy. You may click a picture, put it on social media and challenge your friends to do it. Here’s what you need to do. Well, the rules are pretty simple an you don’t need to shoot any video and waste time uploading it. And the response on the social media is just massive ad I can also say that it will go far ahead. And remember most importantly to nominate 5 of your friends to then take up this Challenge. 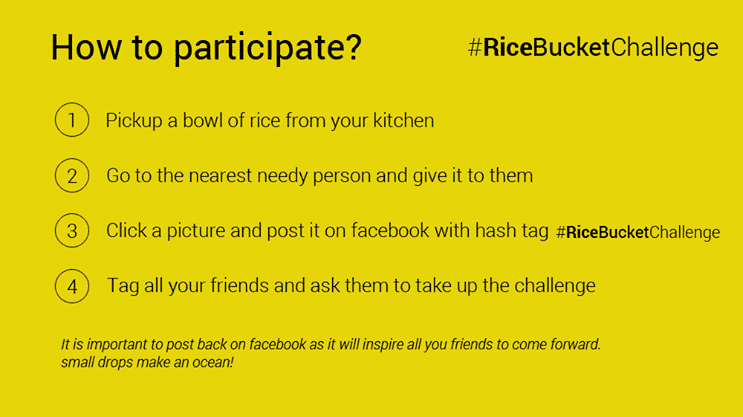 Post your pictures/ videos on your Facebook page/YouTube and share with hashtag of #RiceBucketChallenge. Post by Rice Bucket Challenge. Krupal Kasyap takes up the challenge and nominated a few more people. 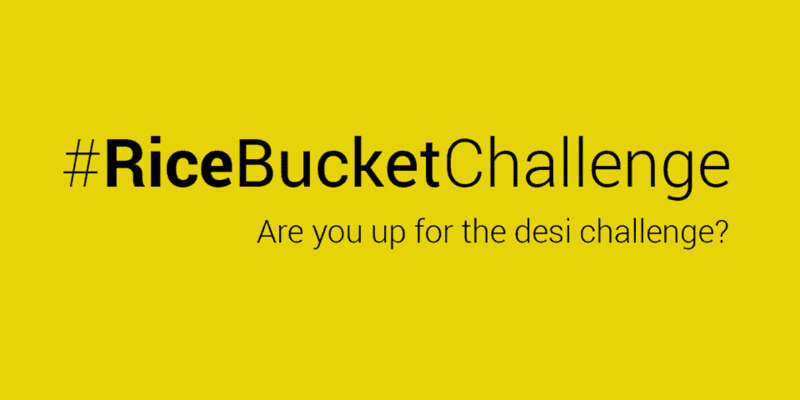 Are you up for the Desi challenge ?